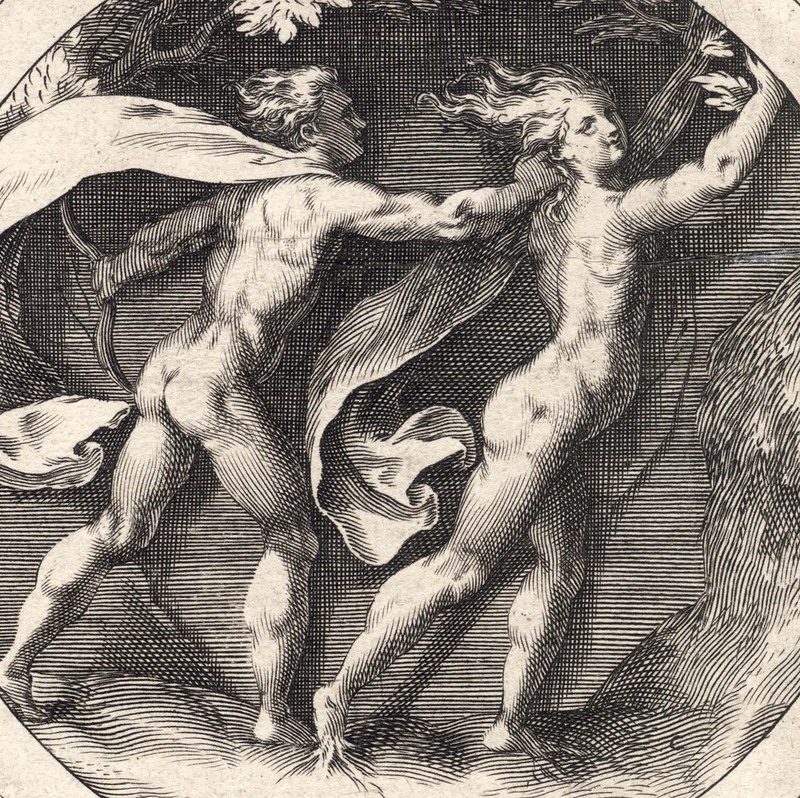 “Apollo pursuing Daphne” (BM title), c1600, plate 9, engraving in reverse after Cherubino Alberti (see BM no. 1874,0808.518; Bartsch XVII.79.87) after Polidoro da Caravaggio (aka Polidoro da Caravaggio; Polidoro Caldara; Polidoro da Caravagio) (c1500–1536/7? ), from the series, “Mythological Scenes” (BM title) or “Gods and Goddesses” (Rijksmuseum title). Engraving on laid paper trimmed to the circular image borderline and backed with a support sheet. Inscribed on plate in front of the left foot of Daphne, “C”. The lettered text that would have been on the plate showed the plate number, “9”, in the upper right and “Polydorus de Caravagio In.” along bottom margin. Condition: crisp and well-inked impression trimmed to the round image borderline and laid onto a support sheet of archival (millennium quality) washi paper. There is a restored printer’s crease (i.e. 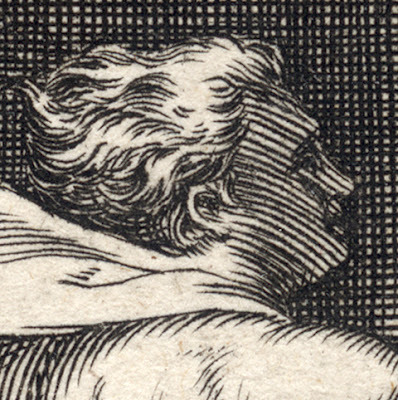 a crease created during the printing process) that is virtually invisible at the upper right; otherwise the print is in excellent condition (i.e. there are no tears, holes, abrasions, stains or foxing). 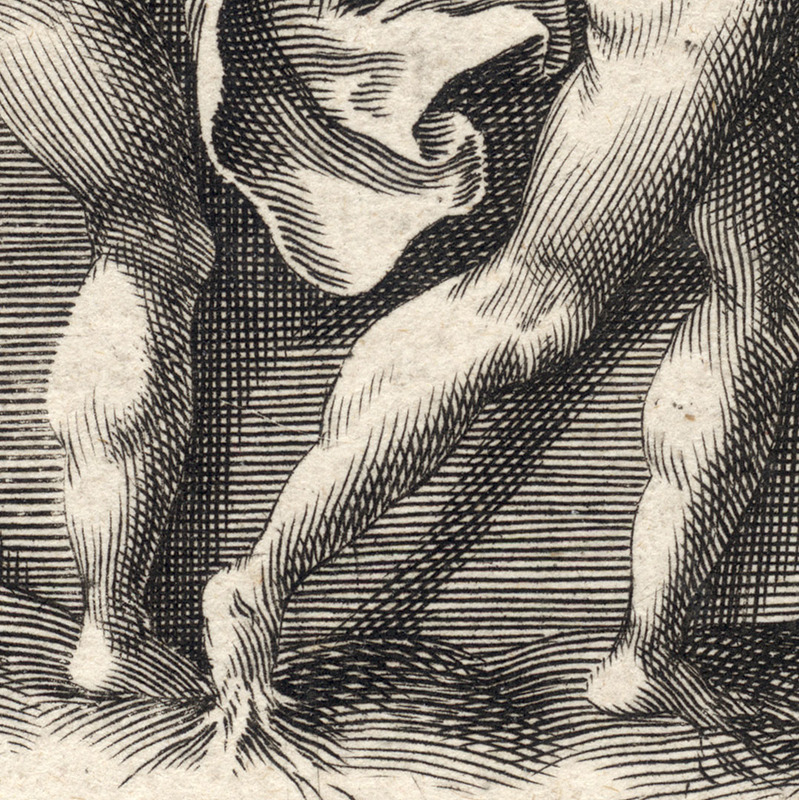 I am selling this magnificent print showing the nymph, Daphne, with her feet beginning to become rooted to the ground as she is transformed into a laurel tree to escape the advance of Apollo, for AU$182 in total (currently US$141.40/EUR114.34/GBP98.87 at the time of posting this listing) including postage and handling to anywhere in the world. 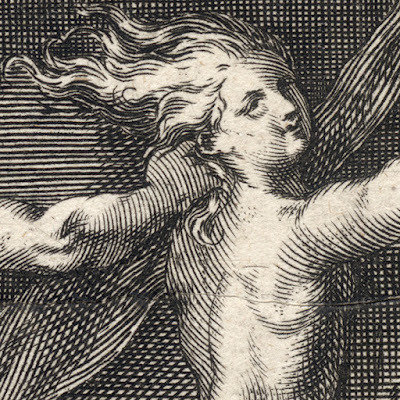 If you are interested in purchasing this engraving from circa 1600 exemplifying the Mannerist spirit, please contact me (oz_jim@printsandprinciples.com) and I will send you a PayPal invoice to make the payment easy. 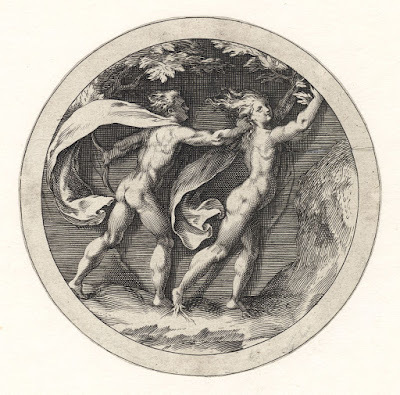 I have been weighing up the likelihood that this is indeed an engraving by Cherubino Alberti as proposed by the Rijksmuseum (see http://hdl.handle.net/10934/RM0001.collect.71379). At first I had my doubts as Alberti had already engraved the same composition in 1590, but in reverse, and inscribed it with his monogram: “CAB” (see http://www.britishmuseum.org/research/collection_online/collection_object_details.aspx?objectId=1442723&partId=1&searchText=Apollo+and+Daphne+&page=1). 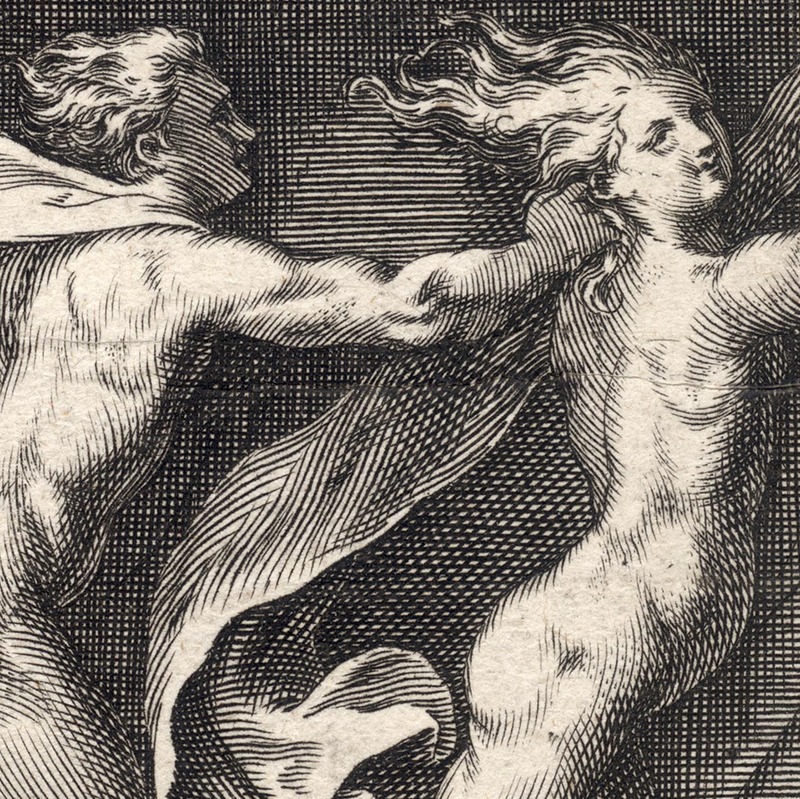 After all, why would an engraver of the skill and prodigious output of Alberti repeat the time consuming task of engraving the same composition again. Of course there might be a very good reason for “redoing” the ten plates in the series which this print features, but as yet I have not discovered such a motivation to repeat himself. Indeed I was so certain that the Rijksmuseum was wrong … but when I looked closely at the print and found the letter, “C”, inscribed in front of the left foot of fleeing Daphne, I could then see the Rijksmuseum’s point: the “C” might very well indicate that the print was executed by great master, Cherubino Alberti. For those who may be unfamiliar with Alberti, he was certainly more famous for engraving prints after other artists—as is the case with this print as it is after the design by Polidoro da Caravaggio—but his real claim to fame is one worthy of knowing: according to the BM he is “acknowledged to be the inventor of the combination of complicated effects of foreshortening with illusionistic perspective …” (http://www.britishmuseum.org/research/search_the_collection_database/term_details.aspx?bioId=134656). Oh my gosh! 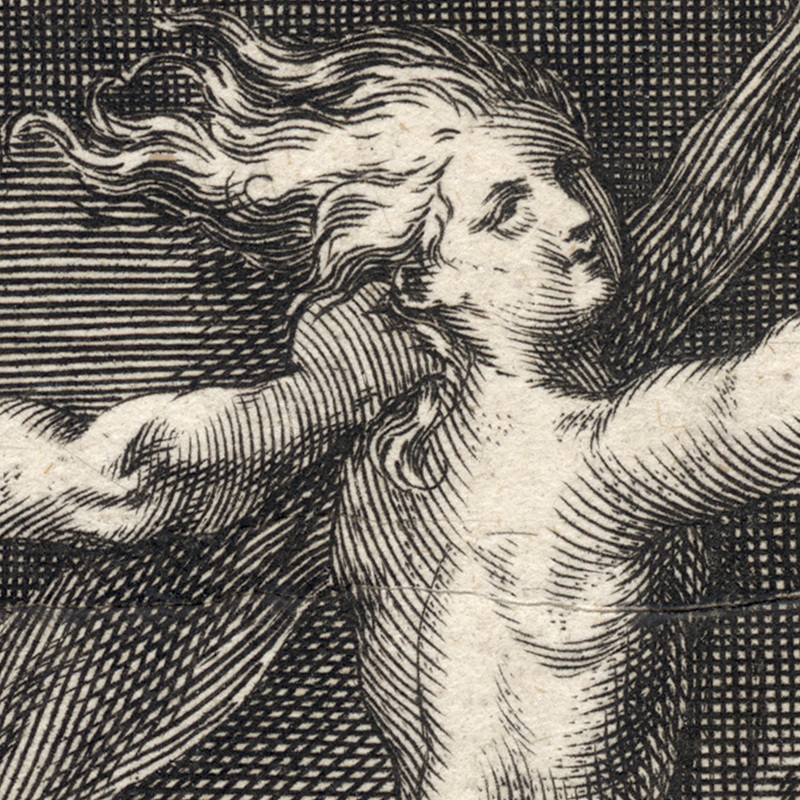 Now that I wrote that little fact regarding Alberti, I looked back to the engraving to examine the use of foreshortening. 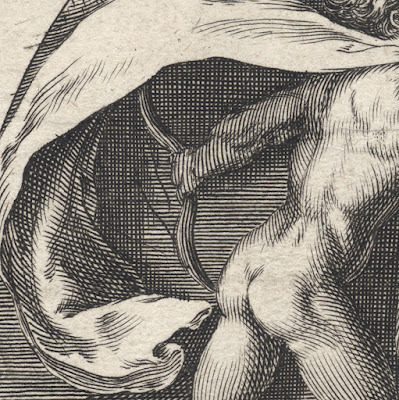 Sadly, I am now not convinced that the print is by Alberti as the deployment of the principle of foreshortening in the rendering of Apollo’s left arm is so poor. This arm is the work of a copyist in the sense that the drawing of the arm's form—to my eyes—is perfunctory and pictorially unconvincing.